And shining morning face, creeping like snail Unwillingly to school. And then the lover, Sighing like furnace, with a woeful ballad Made to his mistress' eyebrow. Then a soldier, Full of strange oaths and bearded like the pard, Jealous in honour, sudden and quick in quarrel, Seeking the bubble reputation Even in the cannon's mouth. And then the justice, Satchel- a small bag, sometimes with a shoulder strap, ballad-any light, simple song, especially one of sentimental or romantic character, having two or more stanzas all sung to the same melody. 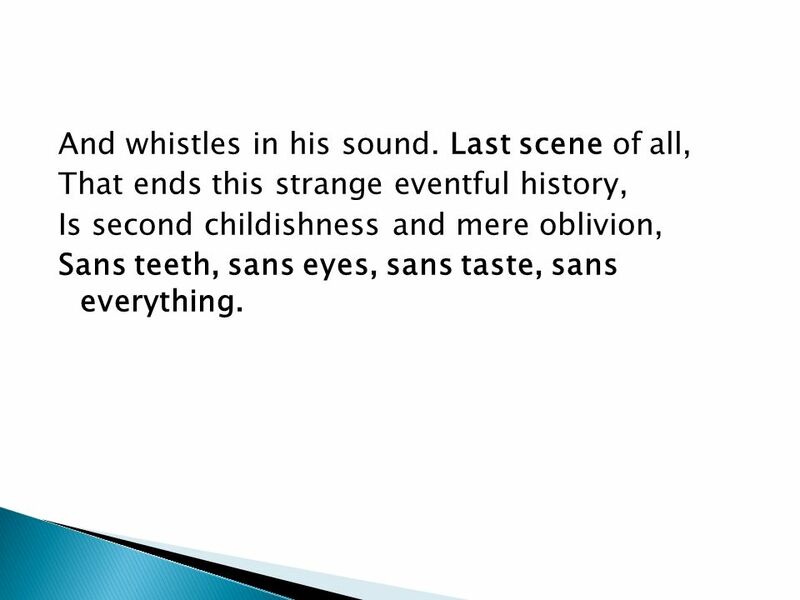 And whistles in his sound. Last scene of all, That ends this strange eventful history, Is second childishness and mere oblivion, Sans teeth, sans eyes, sans taste, sans everything. 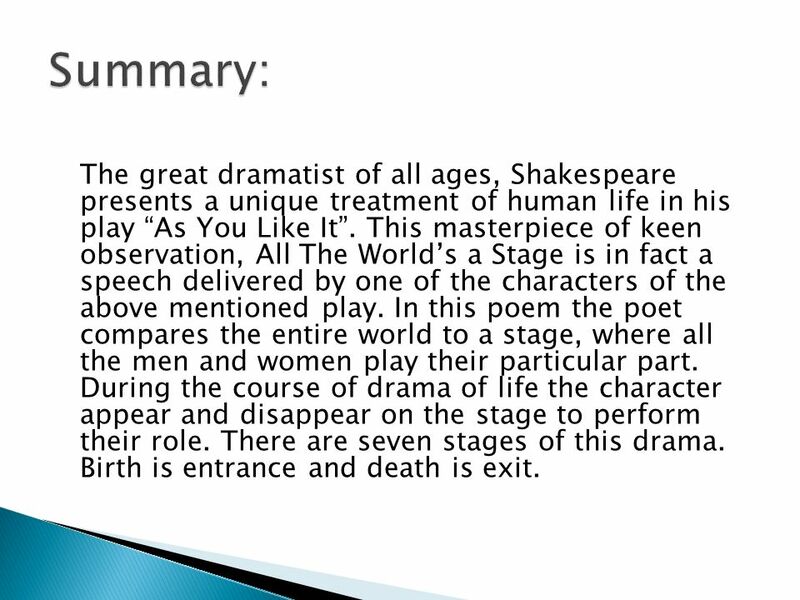 6 Summary: The great dramatist of all ages, Shakespeare presents a unique treatment of human life in his play “As You Like It”. 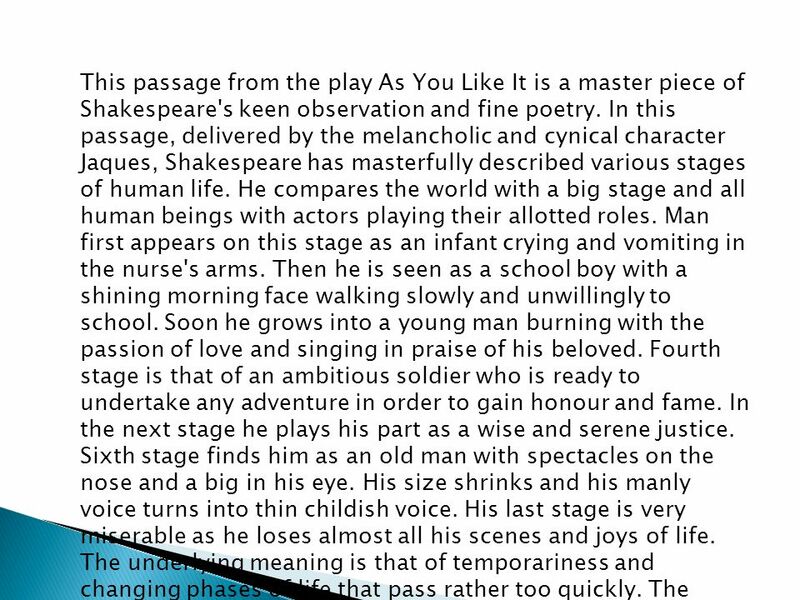 This masterpiece of keen observation, All The World’s a Stage is in fact a speech delivered by one of the characters of the above mentioned play. In this poem the poet compares the entire world to a stage, where all the men and women play their particular part. During the course of drama of life the character appear and disappear on the stage to perform their role. There are seven stages of this drama. Birth is entrance and death is exit. The first period begins and helpless infant in the nurse’s arms vomits feebly. The second stage: a complaining school boy In the second stage a complaining school boy appears on the stage. He goes to school unwillingly like a snail. The third stage: a teenager enters Then a teenager enters the stage sighing like a furnace and singing songs for his beloved. 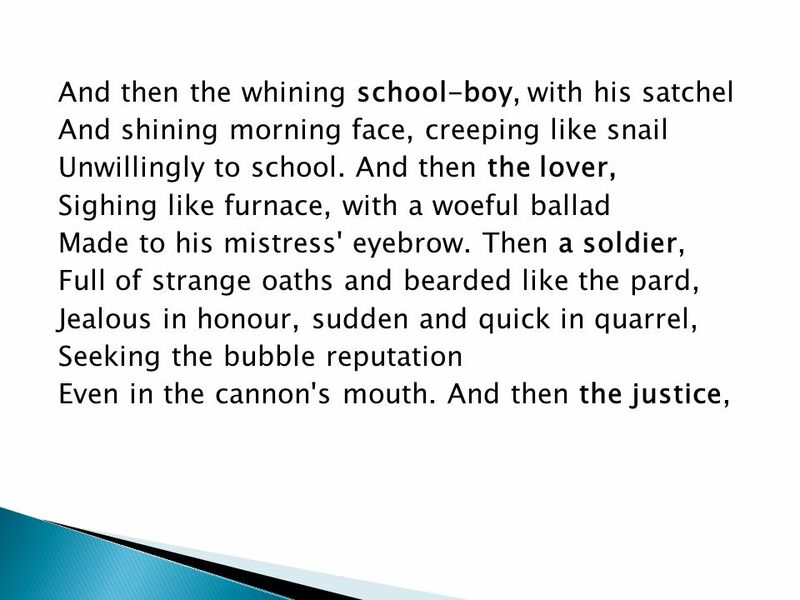 The fourth stage: a man acts as a soldier/professionals After this, man acts as a soldier ready to fight suddenly, seeking prompt fame even in the cannon’s mouth to make his mark in the history. The fifth stage: a judge In the fifth period a judge, with formal beard, fairly round belly and severe eyes appears on the stage of the world. He knows many proverbs and can quote a lot of modern instances. 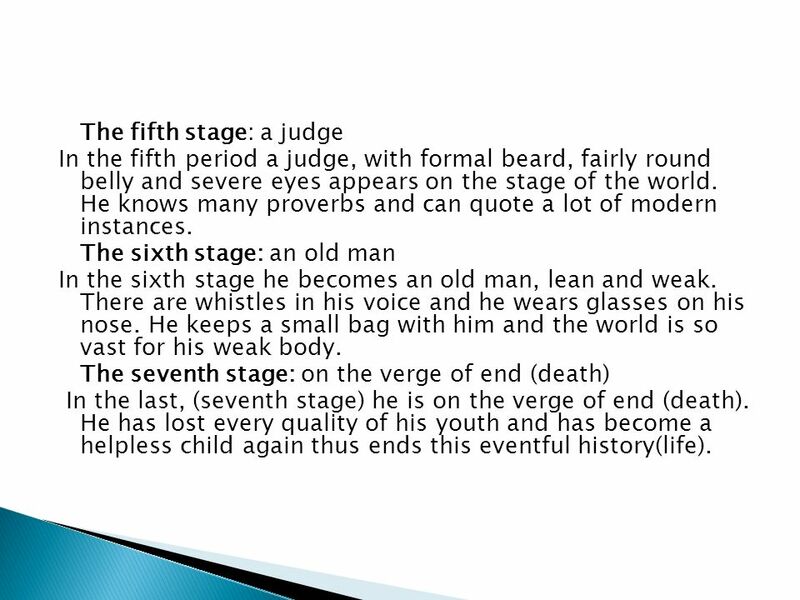 The sixth stage: an old man In the sixth stage he becomes an old man, lean and weak. There are whistles in his voice and he wears glasses on his nose. He keeps a small bag with him and the world is so vast for his weak body. The seventh stage: on the verge of end (death) In the last, (seventh stage) he is on the verge of end (death). He has lost every quality of his youth and has become a helpless child again thus ends this eventful history(life). In the fifth period a judge, with formal beard, fairly round belly and severe eyes appears on the stage of the world. He knows many proverbs and can quote a lot of modern instances. 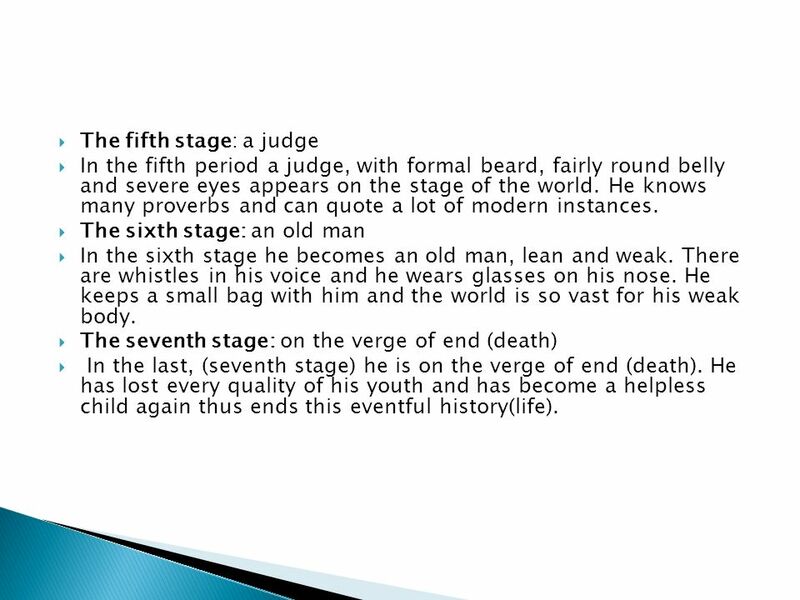 The sixth stage: an old man In the sixth stage he becomes an old man, lean and weak. There are whistles in his voice and he wears glasses on his nose. He keeps a small bag with him and the world is so vast for his weak body. The seventh stage: on the verge of end (death) In the last, (seventh stage) he is on the verge of end (death). He has lost every quality of his youth and has become a helpless child again thus ends this eventful history(life). 10 These different stages hint at the fact that nothing is permanent in this life as life is transient. Interpretation of human life is understandable to some extent but is not agreeable fully. Subtle and sublime rhyme scheme, blank verse, realistic comparison straightforward treatment, fresh imagery, theatrical vocabulary and runon- lines here and there are its special technical features. 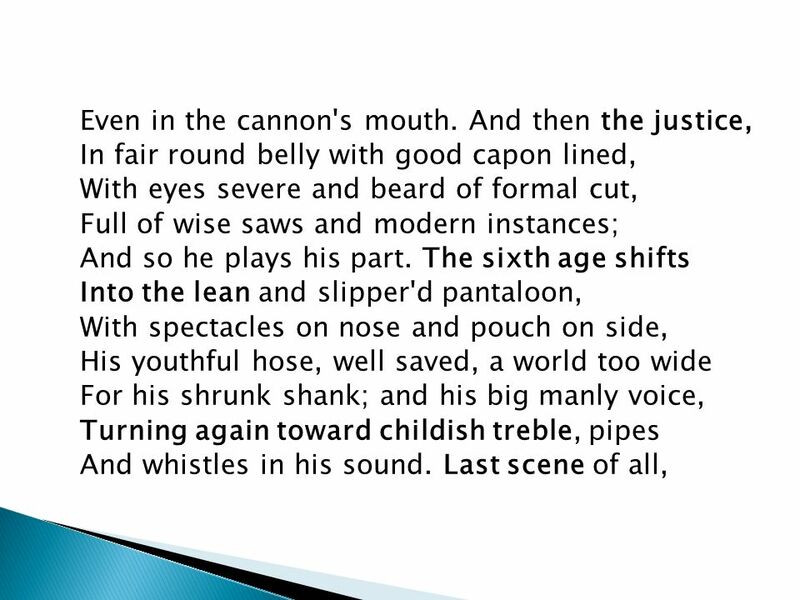 11 This passage from the play As You Like It is a master piece of Shakespeare's keen observation and fine poetry. In this passage, delivered by the melancholic and cynical character Jaques, Shakespeare has masterfully described various stages of human life. He compares the world with a big stage and all human beings with actors playing their allotted roles. Man first appears on this stage as an infant crying and vomiting in the nurse's arms. Then he is seen as a school boy with a shining morning face walking slowly and unwillingly to school. Soon he grows into a young man burning with the passion of love and singing in praise of his beloved. 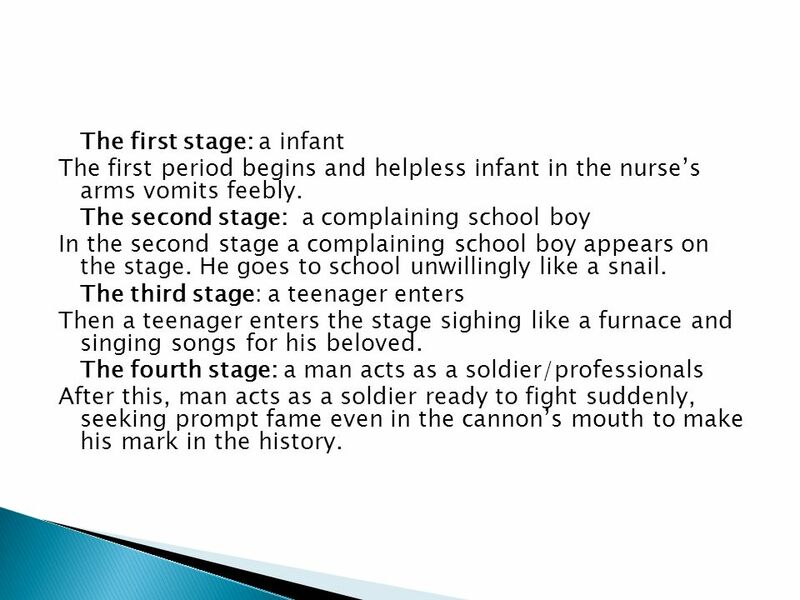 Fourth stage is that of an ambitious soldier who is ready to undertake any adventure in order to gain honour and fame. In the next stage he plays his part as a wise and serene justice. Sixth stage finds him as an old man with spectacles on the nose and a big in his eye. His size shrinks and his manly voice turns into thin childish voice. His last stage is very miserable as he loses almost all his scenes and joys of life. The underlying meaning is that of temporariness and changing phases of life that pass rather too quickly. The language is simple and imagery is fascinating. 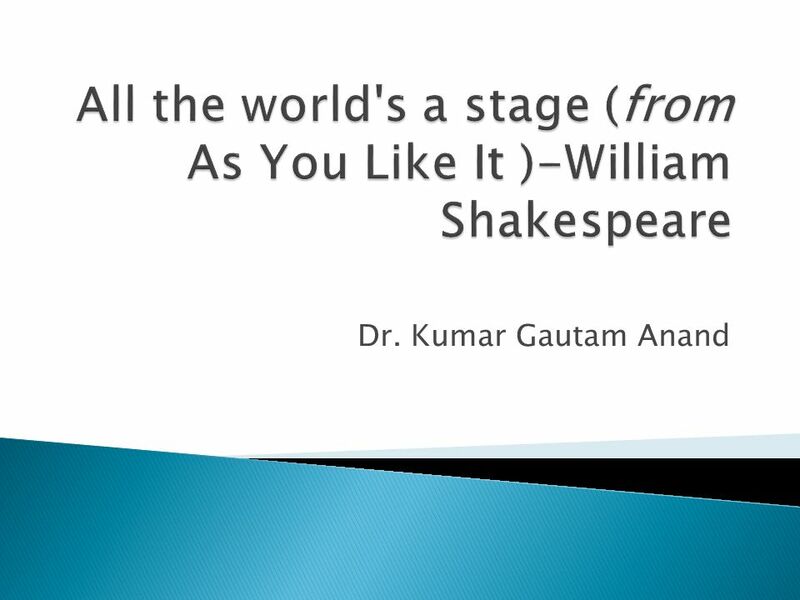 Download ppt "All the world's a stage (from As You Like It )-William Shakespeare"
Stages of life Galina Polikhronidy Grammar school #40 Taraz Kazakhstan. Objective: SWBAT Generate a playful tone within the “Age Poem” by manipulating connotations and common associations with age. 5 December2013 Creative Writing. MPIA Heidelberg, July 2011 Quasar Death Martin Elvis Charles L. Steinhardt 1, Heng Hao 2, Monica Young 3, Guido Risaliti 4, Francesca Civano Harvard-Smithsonian. Extended Metaphor. 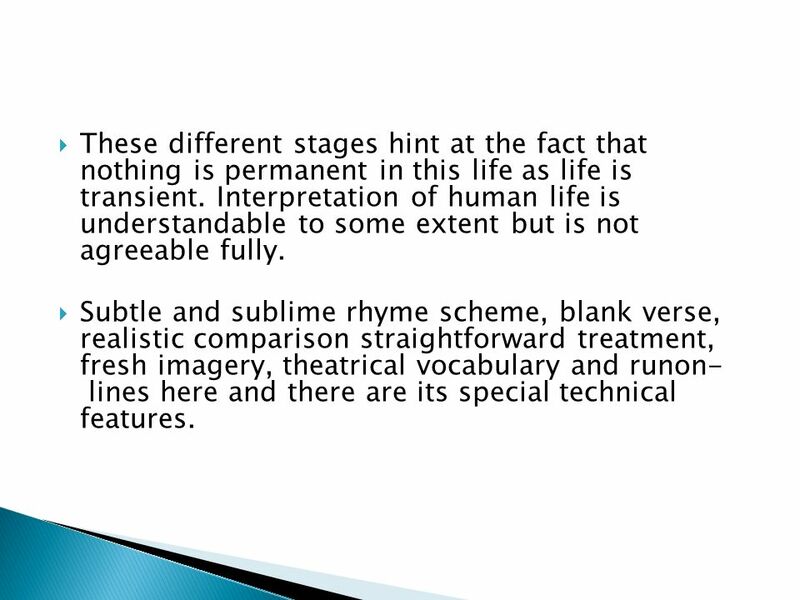 Extended Metaphor Defined  An extended metaphor is a metaphor that has many parts and may be several sentences long.  A regular metaphor. Presented by Farrokh Alemi, Ph.D. Sequence of Disabilities Network Analysis Research conducted by Cari Levy M.D., Manaf Zargoush Ph.D., Raya E. Kheirbek. Shakespeare and As You Like It Acting, Gender, Politics Acting a Gender Love in all its variety. Poem- The Seven Ages by - William Shakespeare. Figures of Speech Metaphors and Similes Personification: Making the World Human Practice Poetry: Seeing Likenesses Feature Menu. Sociology: the Basics Chapter 4. Social Structure: A Guide to Everyday Living Social Interaction – the process by which people act and react in relation. Name It February Your job is to find the poet who wrote these very famous lines. SONNET 18 (Paraphrase) Shall I compare you to a summer's day? You are more lovely and more constant: Rough winds shake the beloved buds of May And summer. LPO Summer 2009 Pete Phillips St John's College Durham Ephesians - Food for the soul… Postcards at front: €1 each, €3 for pack of 5. 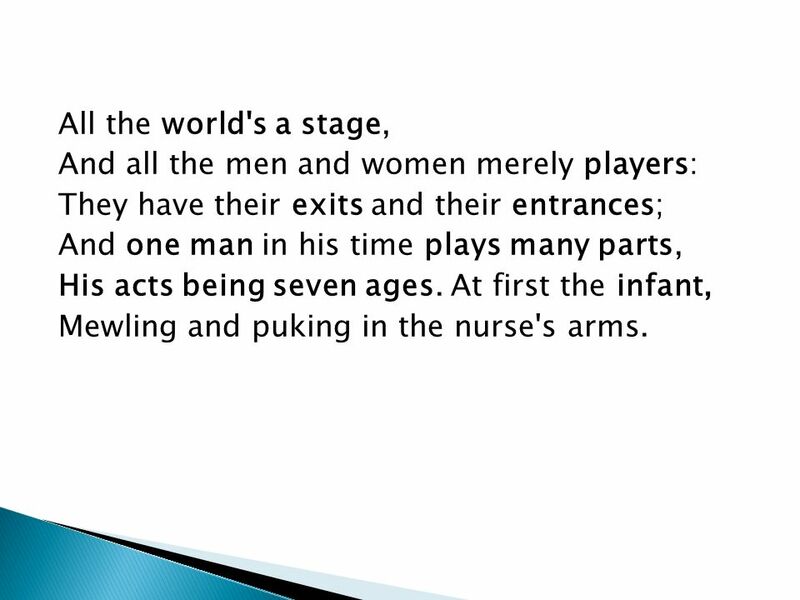 “The seven ages of man” William Shakespeare.